We have a low volume PCB with only three SMT components, two LEDs and an IDC connector, which I've previously made up in small batches, applying the paste manually. I recently needed one for a repair job and rather than making another batch I thought I'd give the V1 a go. It made the job much simpler, looked great, and I sent it out into the plant with a test label on it. I was disappointed when it came back less than a month later with the IDC connector popped off. Looking at the joints it appeared that the copper traces were fine and there was good wetting on both sides of the joint, but in the middle looked a bit grainy, as if it hadn't made temperature there. Understandable, as the PCB is 2mm thick and I had used the standard V1 reflow profile. If weakness is an inherent property of the standard paste supplied, can I easily substitute another paste for use with factory made PCBs? The paste application with the V1 is such a huge improvement over the manual or stencil experience, and I would love to make future use of it. I assume if I change the paste I'll have to run it through the oven (not a problem) rather than using the V1 reflow cycle? Your suspicions may be correct concerning insufficient heat on the thicker FR4. Based on the description, it sounds like you might have gotten a cold joint. The V-One allows for manually configuring the reflow temperature up to 240C - upping the temperature and reflow time might help if it's a problem with cold joints. Regarding the strength of SnBiAg1 solder, Indium corporation released a tech paper that summarized their work and that of HP in evaluating the alloy as a lead-free alternative for Sn63. Their investigation found that the mechanical properties of SnBiAg1 met or surpassed those of Sn63 for most applications below 90C ambient temp. However, if you use lead-based HASL as a finishing step on your PCBs, this can definitely cause problems. Bismuth-based solder will alloy with lead, forming a brittle compound with a very low melting point. If that's the case, you'll need to use an alternative solder paste, or a lead-free finish. If you'd like to try a different paste, you can definitely give that a shot - see my post here for details on selecting a different paste. As mentioned in the post, if the paste has a reflow temp above 215C, I'd suggest using an oven for reflow. We have also sourced and tested different alloys in the past, so if there is enough interest it's something we could consider stocking. Thanks for a very helpful response, Matt. That article is interesting, although no matter how much I zoomed in the vertical axis on the first graph (Strain rate vs Shear) appears to be 10 exp -4 for most of its height! Regarding the components popping off after multiple heat cycles as mentioned in the article, our application involves reading high currents (>10,000 Amps) in copper rods which may be up to 500 degrees C. The Tungsten Carbide tipped probes in the photo press into the copper rod, with perhaps 12,000 readings taken per day. Heat transfer is quite low, as you can see the 3D printed ABS parts are undamaged, but still! I was about to grab some cartridges and nozzles from your web store so I could try out using standard Sn63 paste, but seeing the $90 postage on $70 worth of parts set me back a bit. Surely you can do better than that? If you guys have tested Sn63 pastes it would be great to be able to grab some off your store, pre-loaded into cartridges would be even better. Provided you can do something about that postage, of course!! Should only be $15 for shipping, in fact, I saw your order come in with the correct shipping amount. Can you help me understand where you're seeing $90 in postage? Thanks! It was $90 to my address (Australia), so I sent it via a re-shipper in the US (ShipIto). They'll get it, notify me, and send it on. No time critical contents, so shouldn't be much using USPS. So please pack it in as small a box as possible!! I've noticed local postage is becoming ridiculous here, you are probably seeing the same thing. If I want to send a small parcel (say matchbox size) next door, it will cost me a minimum of $7.50. And even then they won't deliver, just leave a "pick up from post office" note in the letter box, requiring an hour round-trip into town to get it. Don't get me started on the head of Australia Post who was getting $5.7 million annually, bonuses to him because he cut costs by such changes! Meanwhile I just ordered a hulking great battery tab spot welder from China, free postage! I chose USPS as I have work piled up and it will take me at least that long to get around to doing the testing, but AU Post was probably a good option otherwise. Adding the $2 ShipIto fee and the original $15 shipping brings total cost to $23.17, rather than $90, but even using DHL (it was shipped to ShipIto by DHL) the total cost would only be $55.41. The new solder sample package you sent me by Canada post took 29 days to get here, which is a handy data point, I'll have to make note of when this latest shipment gets in! Perhaps your web store could have a "slow delivery" option for non time-critical supplies? Getting back to the original thread topic (@mewertow) , do you have any recommendations for an Sn63 paste that will work well with your system? I have a feeling the stuff I use for stencils and the manual rework airgun may be too thick/grainy/inconsistent for the fine nozzles on the V-One. We have negotiated rates with DHL, I'm going to have to investigate why ours are still so high and what other options we have. Thanks for the data points. The package arrived in today's mail, confirming the 20 day delivery with USPS. I don't know how they managed it exactly to the day, although with DHL I've tracked parcels as far as the local depot, where they have not moved, and when I've rang to query why have been told that delivery was paid for X days, and they hold them until then! Regarding the solder paste, I read somewhere that at least T4 was recommended? I'm currently looking at this one https://www.digikey.com.au/products/en?keywords=SMD291AX250T4-ND, T4, $AU70 plus delivery. Any other suggestions or recommendations welcome. @mewertow As i didn't hear back from you on the best choice of Sn63Pb37 solder to use with the Voltera for applying paste to HASL boards, I bought some T4 from ChipQuik to try, as well as some standard paste in a 5cc tube which I haven't tried yet. The T4 only came in a 10cc tube, so I had to transfer some of it to one of the 5cc ones I got from Voltera. Being new to this my technique was no doubt poor, and I probably got some air into it, because I found it just wanted to keep flowing even after I backed it off. In fact the T4 paste seems very runny, it doesn't want to stop flowing out of the nozzle, and leaves dribbles around the parking areas. Anyway I tried using it to paste my boards, but without real success, and I ended up redoing them manually, using the cartridge from the Voltera! What appeared to happen was that instead of sticking to the pads, the paste was balling up around the tip of the nozzle, so most pads were left bare, with an occasional blob. To my eye the paste appeared to be curling around and creeping back up around the nozzle. So I said to myself, this is obviously a symptom of the nozzle being too low. Or too high. Or the flow rate being too low. Or some combination of these and/or other factors. Hence I thought it best to ask the clever people at Voltera for the benefit of their experience in such matters! When reflowing USB micro-B receptacles (like the kind your phone has) I've seen that the Voltera One's solder makes good logical connections, but after a bit of wiggling or cable replugging the receptacle usually breaks off of the PCB. It might be that I'm doing something wrong, but I'm not expecting any more than good logical connections and have more or less planned to use through hole components and hand soldering for any connectors. If there's ever a certain (and well documented) way to use the Voltera One for connectors I'll be the first to revisit this. @cborn, sorry about the radio silence - after your comment about wanting to use an Sn63 paste, I decided to try some out myself and see if I could get a recommendation to get you going. As it turns out, I've got a formulation on hand that works quite well! It's an Sn60Pb40 alloy, and we'll be putting it up on the store shortly. It's important to note that this alloy is not compatible with the conductive ink, so make sure to use it only for your fabbed boards if you decide to pick one up. About your runny paste issue, you're right that it could be an air bubble that causes leakage after dispensing is terminated. However, it could also just be something related to the rheology of the paste, which is harder to deal with. One thing you could try is to increase the KICK setting in the settings window to 0.4 for solderpaste, and see if that helps at all - note, you will get a lot more paste than expected at first, just use +/- to tune as desired. If you want to remove an air bubble, you'll have to centrifuge the cartridge. However, if you don't have a centrifuge on hand, you can try a trick I used way back - tie the cartridge to a bicycle wheel (tip facing out) and go for a short ride. If you ever see that our solder paste isn't sticking to the board, it's almost always one of two things - either that the board needs to be cleaned with isopropyl alcohol, or that some of the paste has dried out a bit in the nozzle. For the second case, just purge the dispenser for about 20 seconds to clear out the material in the nozzle - you should see a slight color change from light to dark gray. @michael, you're absolutely right - in general we recommend using through-hole components for parts that will be undergoing a lot of torque, like connectors / switches / pots. The other option is to hot glue or epoxy the smt connectors down after soldering, thought that's a bit of a permanent solution. 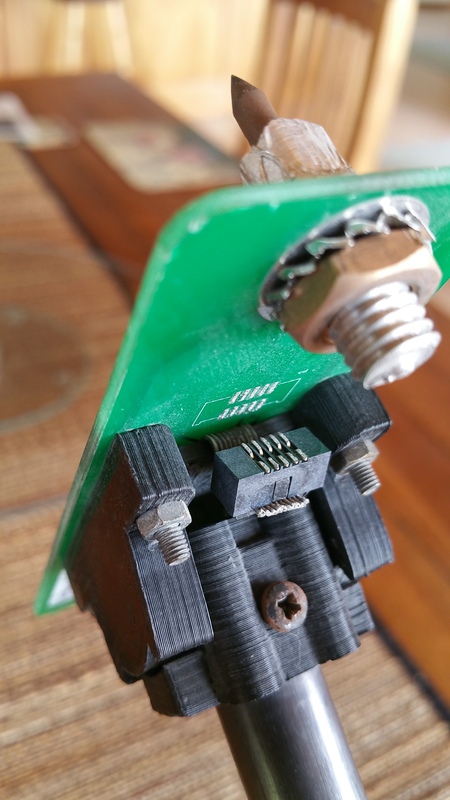 One other thing you could try is hand soldering out the connector to a small hatch pour, as shown by @pathare in his post here. Wow, @mewertow just named a couple good solutions I hadn't thought of. Thanks for mentioning epoxy or similar glue and a small copper pour. Unfortunately it seems Kicad (which I and many others use) can only do solid pours. I really like the suggestion of using a bicycle for a centrifuge replacement, thanks for mentioning that. The nozzles are expensive enough that I want to clean out the ones that clog rather than throwing them out. Thought I should post an update - the new Sn60Pb40 alloy is up on the store! Where did the “new Sn60Pb40 alloy is up on the store” go? We updated the store a few weeks ago - seems like a dead link. I’ve updated it, thanks for the heads up! Just to clarify, the solder alloy we have now is Sn63Pb37, which is practically identical to Sn60Pb40.